Abingdon RDA - Volunteering with us. 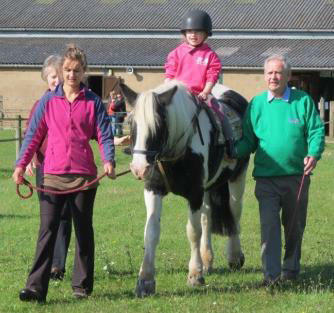 Volunteering is the back bone of RDA. Without our marvelous army of voluntary members there would be no riding, and we are extremely grateful to them all for the many hours they give us - some driving long distances and others coming several times a week. All voluntary helpers receive training when they first join us, and we continue to train them to the level that they wish to attain. Some enjoy side-walking only, whereas others wish to learn to tack up, and do more with the horses. Some go onto being Instructors with the Group. We have many classes each week, both during the day and in the evenings and on Saturday mornings, so from the time point-of-view, there is plenty of choice. 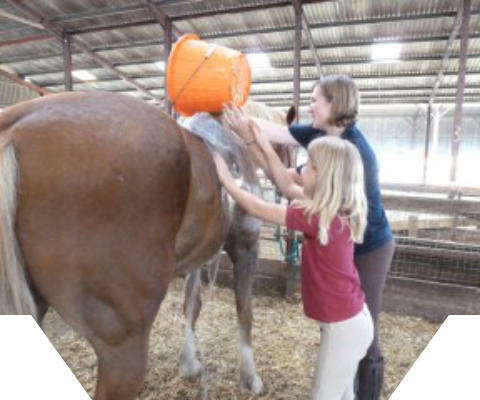 RDA is fun and it is wonderful to see what it does for our riders.” All volunteers must have Disclosure from the Criminal Records Bureau (DBS). Under current legislation this has to be organised from within the group. We are in urgent need for volunteers to help with mucking out (evening or morning) and general yard duties. Please contact us if you can help. Special request: We have 2 brilliant volunteers who check and feed our ponies every Sunday. Are you able to add your name to the list in the tack room to offer emergency cover if our regulars are ill or on holiday? Abingdon RDA - Volunteering with us. Volunteering is the back bone of RDA. Without our marvellous army of voluntary members there would be no riding, and we are extremely grateful to them all for the many hours they give us - some driving long distances and others coming several times a week. All voluntary helpers receive training when they first join us, and we continue to train them to the level that they wish to attain. Some enjoy side-walking only, whereas others wish to learn to tack up, and do more with the horses. Some go onto being Instructors with the Group. We have many classes each week, both during the day and in the evenings and on Saturday mornings, so from the time point-of-view, there is plenty of choice. RDA is fun and it is wonderful to see what it does for our riders.” All volunteers must have Disclosure from the Criminal Records Bureau (CRB). Under current legislation this has to be organised from within the group. We are in urgent need for volunteers to help with mucking out (evening or morning) and general yard duties. Please contact us if you can help. Special request: We have 2 brilliant volunteers who check and feed our ponies every Sunday. Are you able to add your name to the list in the tack room to offer emergency cover if our regulars are ill or on holiday?